Get ready to see an amazing eclipse, a comet encounter, close planetary pairings, and more celestial wonders. 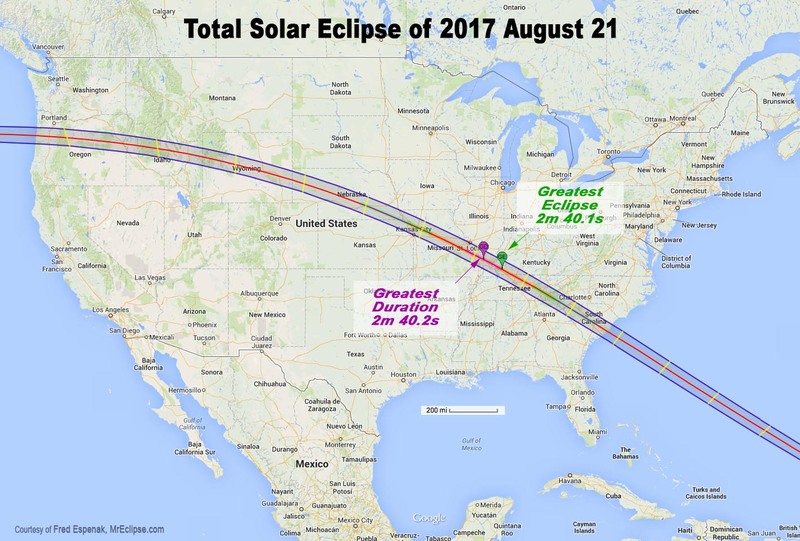 Among the many eye-catching astronomical shows coming up, 2017 may be best remembered for the much anticipated total eclipse of the sun that will cross the continental United States in August. In addition to that spectacular sight, sky-watchers will have a plethora of treats to look forward to in the coming months. To kick things off, an icy comet will swing by Earth in February, hopefully offering picturesque views. Elusive Mercury and giant Jupiter will both put their best faces forward as they appear their biggest and brightest early in the year. And in December, the annual Geminid meteor shower will put on an especially brilliant display. Here's a rundown of these and other superb sky-watching events worth circling on your calendar in 2017. In the first half of February, sky-watchers may get a chance to see a comet swing by Earth. After rounding the sun in December 2016, Comet 45P/Honda-Mrkos-Pajdusakova will be heading back to the outer solar system. On its journey it will make an appearance in our dawn skies, seeming to zip across the constellations Aquila and Hercules. On February 11, it will reach its closest point to Earth at only 7.7 million miles. This should be the best time to catch sight of this icy visitor, since its brightness may reach naked-eye levels, and it should appear as a tiny but distinct fuzzball in the sky. Stay tuned for a detailed viewer’s guide in February. Lucky sky-watchers along a narrow path in the Southern Hemisphere will get to see a “ring of fire” eclipse of the sun. Also known as an annular solar eclipse, this stunning event occurs when the moon’s disk is too small to cover the entire sun, and it leaves a ring of sunshine around the dark lunar silhouette. The eclipse path starts over the South Pacific Ocean, crosses South America, and ends in Africa. North and south of this pathway, a much larger region of the world will be able to witness a partial solar eclipse. The crescent moon will make a neat triangle with two planets in March. After sunset, stargazers should look toward the western sky to see the thin crescent moon forming an impressive celestial triangle with Mercury to its lower right and ruddy Mars above the pair. What makes this event worth watching for, beyond the lovely display, is that the formation will help viewers see Mercury at its brightest and highest in our skies. The innermost planet is normally very hard to spot, since the tiny world usually gets lost in the glare of the sun. But at the end of March, it will reach its most distant point from the sun as seen from Earth, and so will be easier to catch. Jupiter and the moon will make an especially close pairing in April. Brilliant Jupiter will be paired with Spica, the lead star of the constellation Virgo, all year long. But April will be extraspecial, as the largest planet in the solar system will also pair up with the full moon. On this night, both objects will rise together in the east moments after the sun sets in the west. And if you think that Jupiter looks even brighter than normal during this event, that’s because it will have reached opposition just three weeks before, when the planet is the biggest and brightest in our skies for all of 2017. Totality will touch many cities, and expectations are that most of the U.S. population will be within a day’s drive of places to see this dramatic event. A partial eclipse—where the moon seems to take only a bite out of the sun—will be visible over a much wider area across the entire continent. Miss this one and you’ll have to wait until 2024 for the next total solar eclipse to grace North American skies. Stay tuned for detailed eclipse coverage in the months leading up to this grand August sky event. The bright planets Venus and Jupiter will be exceptionally close in our skies in November. Two of the brightest celestial objects in our skies will have a superclose encounter at dawn on November 13. Neighboring planets Venus and Jupiter will have a spectacularly close conjunction very low in the eastern sky. The two worlds will appear to be separated by only 18 arc-minutes, or about equal to the apparent width of a half-lit moon. Since this conjunction event will take place so low to the horizon, the planets will be battling the glare of the morning twilight, and binoculars will make viewing more enjoyable. The annual Geminid meteor shower will reach its peak activity this night for viewers in the Americas. The Geminids are known to be quite prolific, with rates as high as 60 to 120 shooting stars an hour at peak times. This year’s event will be special because sky-watchers will only have to contend with the waning crescent moon until about local midnight. Once the moon sets, the best viewing will be in the predawn hours of December 14—exactly when the shower is predicted to reach its peak performance. Andrew Fazekas, the Night Sky Guy, is the author of Star Trek: The Official Guide to Our Universe and host of Natioanl Geographic Live: Mankind to Mars presentations. Follow him on Twitter, Facebook, and his website.